On May 7, 2011, join Alex Yin and Sandra Giger as we join others in a 5K to raise awareness about organ donation. The run/walk is sponsored by the Washington Regional Transplant Consortium. It is the 2nd Annual 5K Walk/Run for Life at Rock Creek Park, Washington, DC. News Update: Over 500 people came to run or walk. The weather was beautifully sunny and warm. Many people ran as a group, in honor of a beloved organ donor or recipient. 62 people registered under "Team Robert"! SIXTY-TWO and "Team Robert" won the prize for the biggest team! Three heart recipients participated. How thankful we are for your support! 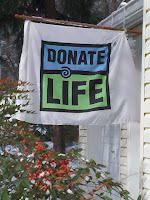 The Washington Regional Transplant Consortium (WRTC), the DC-area organization that promotes awareness for organ and tissue donation, is holding its second annual Donate Life Run/Walk for Life 5K on Saturday, May 7, 2011. 500 individuals will take part in the run/walk to raise awareness, as well as to remember those who have given the ultimate gift of life through organ and tissue donation. Participants include donor family members, transplant recipients and others whose lives have been affected by these brave organ and tissue donors. In memory of Robert Yin, the Robert Yin SPIRIT Foundation is offering to donate $10 to the Wootton Track Team for every runner who registers to run/walk with us on May 7. And, if a runner - or a sponsor - donates another $10 to the Wootton Track Team, the SPIRIT Foundation will match their gift with another $10, for a total of $20 per runner. The SPIRIT Foundation will keep on matching registered runners and Wootton donors, up to the goal of giving $2000 to Wootton Track. Register before March 31, registration will close when the limit of 500 registrants is reached. Download the 2011 registration form here. To qualify for the SPIRIT Foundation donation to Wootton, please be sure to sign up under the team name, "Team Robert"
Let us know after you register.